Where to celebrate Christmas in Israel? In Israel, Christmas is not considered a publicly celebrated holiday. But even so, celebrating Christmas in the Holy Land can be a meaningful and memorable experience for Christians if you know where to go. So, which places should you visit this holiday season? Word on the street is that the best places for Christmas include Bethlehem, Old City of Jerusalem, Jaffa (Tel Aviv) and Nazareth. At the birth place of Jesus, Bethlehem, an impressive and famous midnight mass is held every Christmas Eve. Here, the Church of the Nativity, which is one of the oldest surviving Christian churches, honours the place where Mary gave birth to Jesus. At the main square, Manger Square, people of all walks of life come together to celebrate. On Christmas Eve, join fellow Christians in the Old City of Jerusalem, walking the Via Dolorosa route. There is also a Christmas Eve mass at the magnificent chapel of the Notre Dame of Jerusalem Center that was built by the Vatican in the 19th century. 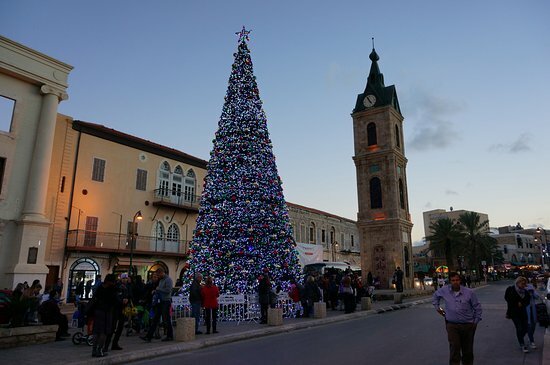 Jaffa’s old-world vibe and its winding alleyways beautified by art galleries and historic stone buildings are even more spectacular during Christmas, when they’re adorned with Christmas trees, lights and Hanukkah menorahs. The Jaffa Flea Market, the Jaffa port that hosts a Christmas market and local church doors welcome people of all shapes and sizes. Believed to be Jesus’ hometown, Nazareth, is home to Israel’s largest Christian population. Here, the festive seasons’ celebrations start early with the light of the Christmas tree in early December. Its city streets are decked out with decorated trees and outdoor street fairs commemorating both Christmas and Hanukkah. Come Christmas Eve, enjoy an elaborate and colourful Christmas Eve parade and fireworks that conclude at the Church of the Annunciation.